Parkinson’s disease, Essential tremors and Dystonia are very debilitating disease’s. DBS or Deep Brain Stimulation treatment brings the normal life back for these patients. Many patients were travelling from Pakistan to India for this treatment but now DBS Center has started functioning in Lahore, Pakistan. In this center foreign trained Professor Shahzad and his team perform the surgery with utmost precision and giving best results using state of the art technology from Inomed Germany and St. Judes USA. Professor Shams was trained by Prof Pieter Slabbert in South Africa and his team members by Prof Lozano in Canada. This Center is giving excellent results with very high patient satisfaction. Our cost for surgery is lowest in Asia. Our results are comparable to any best center in the world. Patients with DBS implanted batteries or Generator are able to perform their daily activities as they were doing before the start of these movement disorders and its a step towards new life for all Pakistani patients suffering from Parkinson’ disease, Essential tremors and Dystonia. Prof Shahzad Shams is the first Neurosurgeon in Punjab and KPK to start Stereotactic neurosurgery in the Private sector which involves mapping the brain in a three dimensional coordinate system. With the help of MRI and CT scans and 3D computer workstations, he is able to accurately target any area of the brain in stereotactic space (3D coordinate system). He uses RM frame system and Inomed IPS Planning software for this purpose. Stereotactic brain biopsy is a minimally invasive procedure that uses this most advanced and cutting edge technology to obtain samples of brain tissue for diagnostic purposes and for aspiration of cystic lesions. Although the origin of functional neurosurgery was motivated by a need to improve psychosurgery, the first patient had a motor disorder (Huntington’s chorea). Before the introduction of stereotactic techniques, the most common surgery for movement disorders involved resection of the motor or pre-motor cortex, since it was proposed as early as 1932 by Bucy and Buchanan for treatment of chorea. In 1933, Putnam interrupted the proprioceptive input by posterolateral cordotomy in an attempt to lessen tremor and rigidity with less risk. Hassler and Riechert reported in 1954 that they had successfully treated Parkinson’s disease as early as in 1952 by ventrolateral thalamotomy. The introduction of levodopa in the 1960s led to a sharp decline in surgery for PD. It was not until a few decades later, when the long-term complications of levodopa became apparent, that interest was rekindled in movement disorder surgery. Many technical advances were made in the interim. 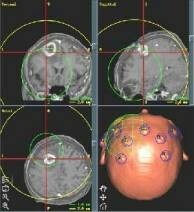 The use of computed tomography and magnetic resonance imaging (MRI) supplanted Ventriculography for target localization. The use of microelectrode recording (MER) became more prevalent and provided an additional method for target confirmation and even the better targets for DBS were identified. Till now hundreds and thousands of patients with various movement and psychiatric patients have benefitted from DBS surgery in the world. ANFN team will provide treatment facilities to people from all over Pakistan and also people from across the borders. ANFN is offering treatment to patients of Parkinson disease, Essential tremors, Dystonia & Tourrete syndrome. The center is aslo intending to provide treatment to patients other than movement disorders including Intractable epilepsy, Severe spasticity & Chronic pain. Prof Shahzad Shams and his team took initiative to address the neglected but vital aspect of Neurosurgery in Pakistan. It will be great service to humanity & especially to the people of Pakistan. The International Neuromodulation Society defines Neuromodulation as “the change in neuronal activity through electrical stimulation or chemicals delivery to targeted sites of the body.” This is done to normalize – or modulate – nerve function. Neuromodulation is an emerging technique which started after it became possible to store and to control electricity in the mid eighteenth century. Its historical basis emanates from Melzack and Wall’s gate control theory of pain proposed in 1965. Initially destructive surgical procedures like cutting the nerves were used but as it came to our knowledge that damage to nervous tissue can itself cause chronic pain, such procedures were replaced with reversible, modulatory treatments like Neuromodulation. Spinal cord stimulation is commonly used since 1980 in which mild electrical pulses are given to the spinal cord that acts as a reversible, non-pharmacological therapy for chronic pain management. The patients who experience significant pain reduction during a temporary trial, a permanent implant may be offered. In permanent implant thin microelectrodes are inserted to the spinal area to be addressed which is connected to a pulse generator through a connecting wire under the skin. Pulse generator is similar to the cardiac pacemaker and is buried under the skin in the abdomen. In 1977 it was first suggested that if morphine (Opioid analgesic) is given into the spinal fluid its effectiveness might be better than if it is given into the blood due to the presence of blood brain barrier. Since the implantation of first morphine infusion pump in 1981, this route is increasingly used world over for intractable pain of cancer as well as non-cancer origin in patients with good life expectancy. As drug doesn’t need to overcome blood brain barrier, only a small dose is sufficient to achieve desired effects with fewer side effects. .
Baclofen is another drug used to treat spasticity since 1984 via intrathecal route. When given directly to the spinal fluid its concentration is 400 times higher with the same dose when given through blood which is highly effective in relieving the symptoms. Intrathecal baclofen has proved to be extremely effective in controlling spasticity due to spinal cord injury and diseases such as multiple sclerosis and can also be effective in spasticity of cerebral origin i.e. after brain injury, stroke, hypoxia etc. Both intrathecal drug delivery systems as well as spinal stimulation devices are becoming smaller in size and more user friendly day by day. Similarly both the techniques are being used in steadily increasing numbers. Neuromodulation can bring considerable relief and improvement; often after all other measures have failed. Its earlier implementation may even modify the course of some conditions; it should not be regarded as a treatment of last resort. At ANFN center we offer both spinal cord stimulation as well as implantation of intrathecal drug delivery systems to carefully selected patients whose chronic conditions cause significant suffering and disability. We use US made stimulation implants and infusion pumps in the drug delivery system. All the procedures are done according to the international standards maintained by International Neuromodulation Society guidelines.